During the Fall of 2016, I spent the better part of a week in Spain with my friend Mary. We flew from London to Madrid and then took the train to Barcelona. Because we had so little time and wanted to see so much, we ended up rushing Barcelona which I really regretted. Both cities are so unique and now that I returned to Barcelona a second time, I can officially say it is one of my favorite cities in the world! I've rounded up my top sights and restaurants to help you plan your ultimate Spanish getaway! LAS RAMBLAS: Visiting this bustling and vibrant street just a few weeks after the terrorist attack was a bitter sweet experience. It reminded me of how blessed I have been throughout all of my travels. We enjoyed walking down the strip of shops, but prices will be jacked up here, so I recommend scouting out what items you may want to purchase and waiting until you're in a less touristy neighborhood to buy. Don't miss out on Boqueria Market, a vibrant food market. PORT VELL, BARCELONA MARINA: Just a short walk from Las Ramblas, the Gothic District, and Columbus Monument, there's a stunning ocean view from the shoreline of Barcelona. The marina is filled with gorgeous sailboats and mega yachts. Andrew and I were dreaming big time. We must have asked each other a dozen times which boat we'd choose if we had an infinite budget. Sometimes it's fun to dream ;) One of the city's biggest malls is located right along the water and there's always fun antique, thrift, and book markets set up as well. We found ourselves returning to that spot every day for a few hours. It was the perfect amount of vibrancy that you'd want from a city, paired with tranquility from the sea. GAUDÍ BUILDINGS: Antoni Gaudí is one of the most impressive artists I have learned about. In his lifetime, he created nineteen incredible buildings throughout the world and Barcelona has a few of his most memorable. We played "I Spy" as we walked through the city because it seemed like his buildings popped up around every corner. Some of our favorites were La Pedrera and Casa Batlló. We didn't go inside the buildings because we felt like the exteriors spoke for themselves. There's another Gaudí masterpiece we visited later, so read more below! NATIONAL MUSEUM OF CATALANYA: The building is so magnificent you would think it was the royal palace (which is actually located in Madrid!) Fountains line the street as you walk up towards the Museum. It's situated so high on a hill that they installed escalators to help make your brief journey a bit easier. On a nice day you get an incredible view of the city! CATHEDRAL OF BARCELONA: There are small pockets of Barcelona that still hold on to its gothic and medieval past. This cathedral has a the gothic influence that differs from Barcelona's most famous church, La Sagrada Familia (guess who designed it?!). The Cathedral of Barcelona is tucked in a small neighborhood of winding streets with lots of shops. We had gorgeous weather on the Saturday that we visited which brought out street performers. We sat on the steps of the cathedral listening to a mesmerizing guitar and vocal duo. PARK GÜELL: WOW is all I can say about this sight. Not only is it a beautiful walk around the park, but Gaudí (yes, of course he designed it) did an absolutely incredible job architecturally. His work almost looks like a crayon box exploded on an oddly shaped building...in the absolute best way possible. *WARNING* You must pre-book your tickets. I didn't know this during my first trip to Barcelona and Mary and I couldn't go into the best part of the park. You'll be able to walk around the park for free, but going inside was 100 times better. Make sure you schedule your trip on the sunniest day you have because you'll get the best views and pictures. This was by far my favorite sight in all of Barcelona! LA SAGRADA FAMILIA: Just when I think Gaudí couldn't impress me anymore, he does it again! La Sagrada Familia was unfinished at the time of Gaudí's death and it seems to always be under construction. Regardless, the size alone is striking. Barcelona does not have very high buildings, so the cathedral is absolutely massive in comparison. It sticks out like a sore thumb (in an amazing way) when you see the city up high from Park Güell. If you'd like to go in, you also must book tickets. Another option is to attend a mass, but be sure to get there early, because it's incredibly popular and understandably so! PARK DE LA CIUTADELLA: Think New York's Central Park...We visited on a Sunday which meant the park was flooded with families enjoying picnics, dogs running freely, and couples enjoying coffee. Andrew found out there was a small pond in the center of the park where you could rent row boats, so of course we had to go! Where there's water, there's Andrew. It ended up being a wonderful hour of floating around and just enjoying the sun. After spending a month in cold and damp Ireland, I needed the sun more than I realized! It's only a few euros to rent the boat and a perfect way to rest those feet after walking. 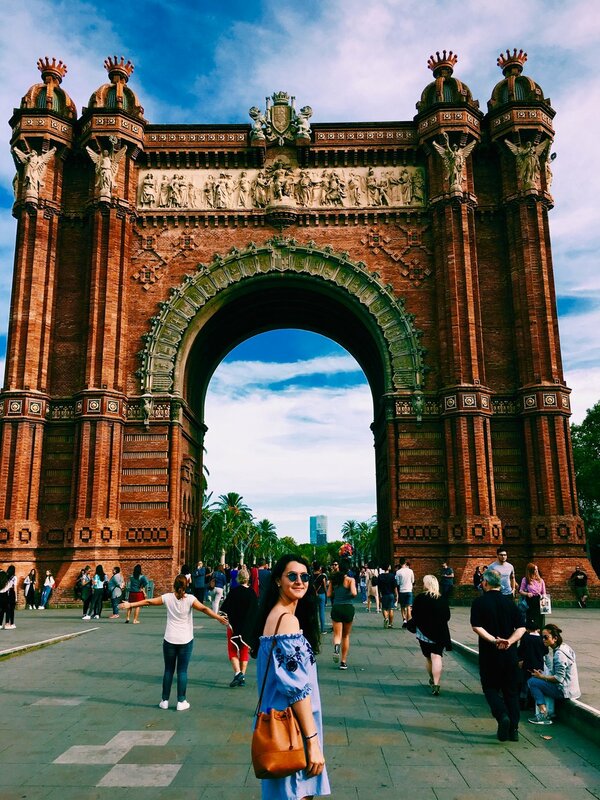 ARC DE TRIOMF: Barcelona's architecture truly does not disappoint. The Arc, located in walking distance of Park de la Ciutadella, is a hot spot for talented street performers. It's also just a super photogenic spot in the city! Spain is known for its inexpensive tapas and sangría menu. That's just one small (but important!) reason I love traveling there. I never break the bank with my dining and the dishes always have so much flavor! We found some of the most delicious restaurants and cafés throughout the city. CECCONI'S: This was our top all-around restaurant in Barcelona. Though it wasn't traditional Spanish cuisine, the food and atmosphere was impeccable. We very rarely take our time eating and just enjoy each other's conversation because we're always on to the next thing, but we definitely did at Cecconi's! It's close by the water, so you can take a walk down to the marina afterwards. I recommend splitting a pizza for a starter. It was delicious! Also, I must find out who designed the restaurant, because I need to replicate it in my future home! MARITIM: Talk about a beautiful dinner view! This restaurant has the best view of the marina at sunset. It was almost too good to be real. In Spain, it is customary to eat dinner later in the evening, so if you want to have the restaurant to yourself, book a reservation at 7:30 p.m. when they open like we did! SINGULAR: We found this little gem of a café near La Sagrada Familia. It had the coolest layout and delicious food. I've never devoured a burger so quickly! It's well worth your visit. BRUNCH & CAKE: If you want the most delicious & healthy breakfast, be sure to stop here! *Warning* This café is incredibly popular! If you're not one of the first few people to arrive, you will have to wait a very long time! They have some of the most beautiful dishes I've ever seen. I had the ricotta pancakes and loved it! Be sure to check out their beautiful website. This time around we found it difficult to find an AirBnB in our price range because we only booked this trip about two weeks before we left! With the options left, it was cheaper to book a hotel. It was nice to have a hotel for the weekend, though I definitely missed having that "homey" feeling I get with AirBnB's. I missed having a kitchen to cook breakfast or make coffee. Whenever I don't stay in an AirBnB, I'm reminded of how wonderful the concept truly is. You're no longer a tourist, you're a local. You live in the city like anyone else would. I also love connecting with my hosts and getting personal recommendations from them. If you're traveling to Barcelona, I recommend this AirBnB that Mary and I used last September. It's a short subway ride from all the major attractions. My recommendation is to purchase the multi-day transport card. They have two, three, four or five-day passes. You can use any mode of transportation (tram, bus, and metro) as a part of this pass, so it's well-worth your money. Side note: your pass only includes the red buses in the city, not the yellow. The yellow buses are owned by a separate company that doesn't benefit from the Barcelona multi-day passes. We made that mistake! I LOVED the public transportation system...it's so easy to use. Barcelona is a much bigger city than I expected, so you'll definitely be relying on public transportation! I'm so grateful for the opportunity to fall in love with Barcelona again. It's very important to plan your trips in advance so you can get the most out of your time. You ideally need two to three days in Barcelona. After that, you'll be trying harder to find interesting and new things to do. You'll be surprised: if you plan your days, you can fit a lot in! I loved the vibrant and friendly culture in Spain. Having some Vitamin D also helped a lot! Happiest of birthdays to my love, Andrew. It's always a joy to discover new places & fall more in love with the world along side you. To many, many more trips. Feliz Cumpleaños!